PT300DW™ scales have been setting the bar for portable, self-contained, compact wheel load scales for decades. Used to maximize legal payloads with concern for violations and reduction of maintenance due to overload stress on equipment, these all aluminum, fully electronic scales are capable of weighing up to 40,000lbs (18,000kgs) with an accuracy of ± 1%. The scales are fully battery operated and only require infrequent recharging through 12V, 110V, or 220V power sources. Standard Rechargeable AA Batteries last up to 300 Hours in the Scales. In addition, battery life has been significantly enhanced with the use of solar panels that will power the scales for up to a year before needing direct power charging with daytime outdoor use. 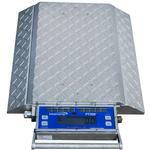 PT300DW ™ Scales are sturdy, portable and compact. Lightweight and accurate, this all-aluminum design is ideal for uneven surfaces and withstands most weather conditions. The PT300DW ™ is designed to maximize legal payloads with concerns for violations and reduction of maintenance due to overload stress on equipment.